Viewed from the underside of the 'fin-plate' Glider projects a more contemporary stairs design with much of the metal structure exposed. The metal has been sanded and primed and is ready for the client to finish paint ensuring the stairs can be incorporated seamlessly into the overall colour scheme of the house (it may also be changed over time if the client wishes to do so). Signature Stairs offer two stairs styles in our 'Glider' modern stairs range, differing mainly in how the step is supported. The above project is a 'Box' support with a fully clad, floating step. This elegant structure floats from the ground to first floor and can be finished with either our stainless & glass balustrades or frameless glass balustrade as above. This 'fin-plate' support Glider central spine stairs is the second option in the Glider contemporary stairs range. Here the steps are supported with a broad 'fin' support to the underside of the step giving it a more contemporary staircase appearance. In this project the client chose to finish the stairs with our 'Elegant' stainless steel & glass balustrade with a stainless handrail and solid oak steps. In this variation of our 'box' support Glider modern staircase design the client finished the walnut stairs with customised stainless steel balustrade. The balustrade consists of 'laser cut' square uprights. Laser cutting enables a clean and crisp finish unattainable through traditional fabrication methods. The stainless uprights and infill are beautifully complimented with a solid walnut handrail. Our 15 mm clear toughened glass balustrade to the 'box' support Glider modern stairs compliments and enhances to the openness of the design. This project is a perfect example of how a Glider stairs can be best utilised. The stairs is a functional yet beautiful feature in the living space while managing not to take from the picture widow directly behind the stairs. Installed in the entrance hall this Glider contemporary stairs gives a 'WOW' effect as friends enter your home. 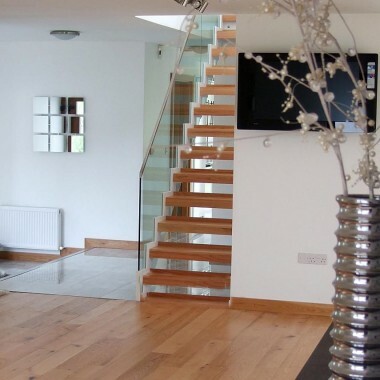 The contrast between the walnut steps, stainless & glass balustrade and the white colour scheme ensures that this Signature stairs is a stand out feature in any home. 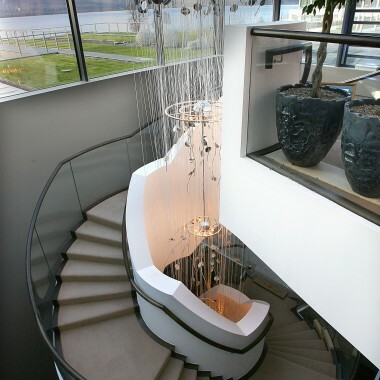 The modern staircase pictured above was a bespoke stairs commission. With a unique circular support system this contemporary stairs design sits effortlessly into what is a traditional old style dwelling. Again the contrast of the laser cut stainless steel balustrades against the walnut steps combines for a stunning visual effect. This 'fin-plate' Glider modern staircase has been finished with a nautical theme wire rope balustrade. Most effective in a straight flight stairs, there are however restrictions as to how and when horizontal railings can be used. While we are happy to fabricate to client specifications we always inform customers of the regulations and their engineer is required to sign-off on all elements of custom stairs designs. 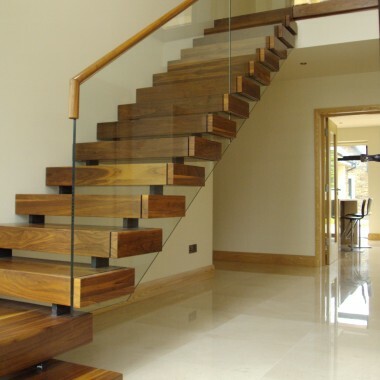 Signature Stairs manufacture a wide range of contemporary staircases. The Glider, so called as the single central spine structure glides from the ground to first floor with steps seemingly suspended mid air, is an excellent example of one of our modern stairs designs. Beautifully designed with a versatile structure the central spine works well in all shapes of stairs. 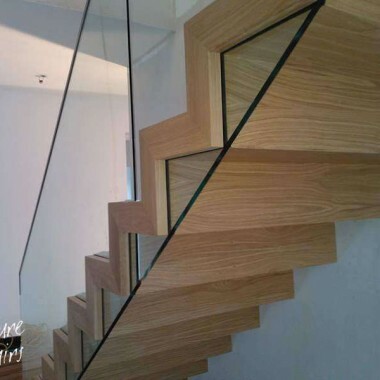 Clients have the option of either a fin-plate or box-support style to the steps of the Glider contemporary staircase. The Fin-plate support option makes a more contemporary stairs statement by exposing the metal structure to the stairs. The exposed fin-plate support to the step is finished with solid timber thread to the top side only. The Glider works well with Signature’s ‘Elegant Killarney Balustrade’ – stainless steel & glass balustrade. The box support version of the modern stairs design minimises the visible structure by reducing the size of the support to steps and fully cladding them in solid timber. This style is particularly suited to ‘free standing glass’ balustrade and can be finished with timber or stainless steel fixings to the outside of the glass balustrade and there is also an option of timber or stainless steel handrails. As with all other Signature Stairs, clients can choose from a number of timber finishes and any visible mild steel is sanded, filled and primed ready for finish colour by the client. This ensures that the glider contemporary stairs can be fully integrated into the interior design colour scheme of your home.